Author of the Unbound series from Silhouette Nocturne. Well it sounds like a really cool premise at least! 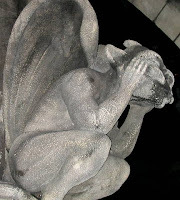 Gargoyles aren't very common in paranormals but they're still fascinating! Lady_tink the premise was excellent, I think she just tried to pack too much into a short piece. There was probably enough ideas and story arcs for a novella or novel.